A Life On--and After--the Farm: A Pony for the Freezin'-a** Winter? When I was a small child, I discovered the joy of reading. This was one of my favorite books. It was given to me by a teacher for my achievements. It may very well be the first indication that horses were in my future! I'm going to see if I still have this one. It's overdue for a re-read. Keeping a pony for the winter sounds a bit romantic, doesn't it? My best recollection is that a little girl wanted her parents to allow her to board the pony for a carnival that used it for rides during the warmer seasons. Oh, if only I could talk my dad and mom into that! As a child, I can imagine that I thought the only hurdle for the little girl was convincing her parents how cute they were and having a fence around the backyard. HA! Talk about a fantasy world... True, I don't remember much about the book; but I do remember there was no mention of carrying 5 gallon buckets filled with water through ten- inch drifts of snow and ice, being extra cautious not to spill any on her for fear of frostbite from the below-zero windchill! Nor was there any mention of pushing a wheel barrow through that deep frosty mess. Or how about trying to dump said wheel barrow only to find the cargo frozen to the bottom of the cart? I'm fairly certain there was nothing written about miles of extension cords trailing to heated water buckets, or having to clean out those hanging buckets when that cute little pony decides to use it as a port-o-john! I'll bet that sweet child never twisted her ankle by stepping down wrong on a frozen... uh... dumpling. I don't recall if the girl in the story had a dog. If she had, it would have been fun to watch her little dog running from the stall with... uh... dumpling stains on his pretty white face. Yes, keeping a pony for the winter isn't exactly a romance, but I do enjoy the break from the heavier smells of summer and the biting flies. I like that I can clean both stalls without stopping to wipe the sweat from my brow. And there's nothing better than a horseback ride through fluffy white snow on a sunny winter day. A big plus is walking through the paddock without sinking ankle-deep in muck. Now, if only we can get back to normal temperatures and I can dump this cold... I will ride off into the sunset on my pony for the winter. Don't you agree it would look lovely in my blue country kitchen? I used to say, "I never win anything!" but not anymore... I won a signed book last month! Maybe I'm on a roll. Or maybe I'm just wishin'. BTW... That's Mr J's voice you hear calling to Nekoda. She was upset that I took her BFF Maggie for a ride. I never wanted a pony when I was growing up, instead I wanted a dolphin - just like Flipper. I had the whole thing planned. He would live in our bathtub. Alas! Unlike you, I never got my fondest desire. Thank goodness. Can you imagine sharing the tub with a big porpoise. Finally, at age 17, I bought a roan gelding, 17 hands high from a family who filed bankruptcy, for $40. Paid out of my babysitting money and working part time at May Co. I named him Rusty and kept him about a year. Because I worked so much, my younger sister rode him more than I, but I footed the bill. When I sold him, I doubled my money... but have always held a special spot in my heart for horses. I was never one of those kids who wanted a pony. But unlike Rae, I didn't want a dolphin, either! It was perfect for me to have a dog, as unexciting as that was to others, I loved my collie. My dreams were your dreams but I never read your book...now I want to find it! We have to ride together next spring, lily...before I get too old!!!!! 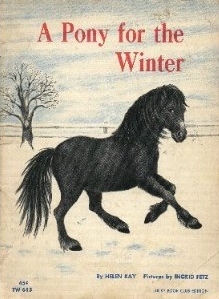 Now there's a new book idea for you — The Low Down on a Pony for the Winter. Ha! Then all those folks who think it's a breeze to own a horse, would get the full scoop (and I'm talking dumplings, lol). We never owned a pony, but grandpa and other family members did. I got to ride to my heart's content when we visited Georgia each summer and settled for the local stables when we were at home. Now it's been so many years I'm content to stop in and visit with yours. I never was a little girl wanting a pony, but I remember having all sorts of romantic thoughts and wishes from books I would read. Still do. Books just can take us off into another world, can't they. A good book will do that. Bless you for taking such good care of your horses. I'm so glad they have a barn. I always worried about the horses in sub-zero temps in Minnesota. 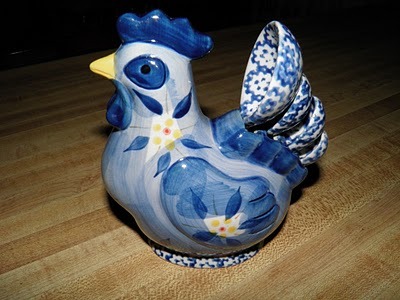 Hope you win the blue chicken! This post brings to mind a horse or pony book I had long ago which I reread many times, but now I can't remember the title! My childhood was spent in a large city, and ponies weren't on my mind (with the exception of this book I can't recall).